Bloomberg's update in the wake of the week-long Deer Park oil processing plant fire (now extinguished) and chemical spill holds nothing back, but underscores the seriousness of the situation after both city and Intercontinental Terminals Co. (ITC) previously sought to reassure residents days ago that "everything's fine". 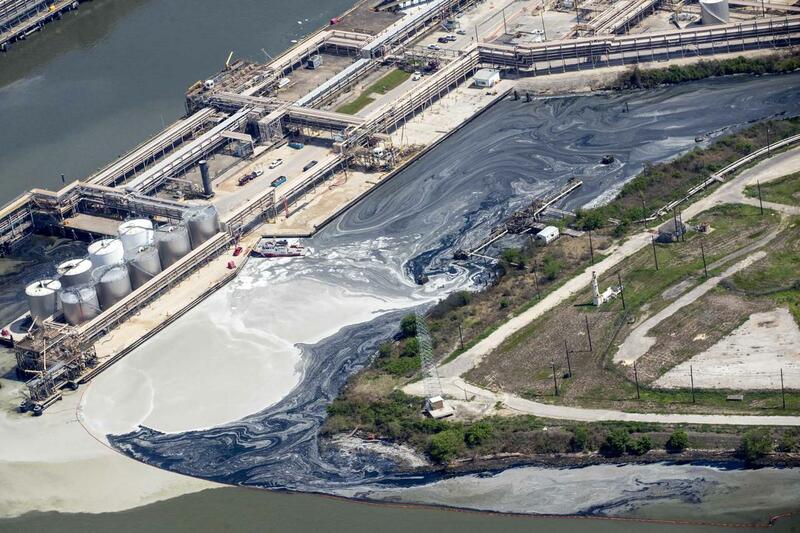 Instead, as Bloomberg's aptly titled headline reads, "Cloud of Cancer-Causing Chemical Hangs Over the Houston Channel" — this as hundreds of area residents have sought medical help for illnesses ranging from nausea to headaches to irritation and burning in the skin, eyes, nose and throat. For many days running the nation was captivated by dramatic images of flames and smoke plumes hovering above the Houston area from the Deer Park petrochemical fire, which had initially triggered an emergency shelter-in-place order from city authorities when it began last Sunday March 17; and while firefighters had extinguished the raging inferno on Thursday, multiple chemical tanks reignited again late Friday, complicating efforts to clean up a massive chemical spill into the nearby Houston Ship Channel. 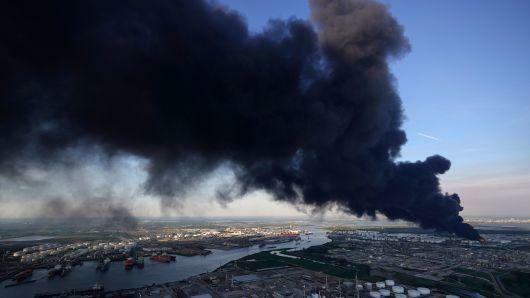 With the fire now extinguished, Houston and Harris County area residents, especially those closest to Deer Park, are now concerned over dangerous levels of exposure to the chemical tanks which had burned for days: benzene, xylene, naphtha, toluene, and pyrolysis gasoline, known as Pygas, along with other oil processing related chemicals. City and environmental officials have throughout the ordeal assured residents that Harris County Pollution Control was conducing air quality monitoring tests of the area, but still cautioned residents to stay indoors throughout the ordeal if at all possible. Days into the fire city officials had released a statement alerting the public to elevated levels of benzene, described as "a colorless, sweet-smelling chemical that can be derived from natural gas, crude oil or coal, can cause cancer, infertility and birth defects in the developing fetus of pregnant women among other things" according to the Centers for Disease Control and Prevention. Benzene is a known carcinogen which can cause devastating health effects based on various levels of exposure. Residents have become increasingly anxious and angry with both Deer Park and ITC's over what the Houston Chronicle describes as "volatile compounds sitting in damaged tanks at the petroleum storage facility or streaming into nearby waterways." The U.S. Coast Guard is forbidding vessel traffic on a stretch of the key industrial shipping route after a wall collapse and fire at Intercontinental Terminals Co.’s already-damaged chemical storage complex on Friday. A mix of toxic gasoline ingredients, firefighting foam and dirty water flowed from the site into the channel, and a benzene plume above the water poses a threat to ship crews, said Coast Guard Capt. Kevin Oditt. Area schools and some roadways had remained shut down throughout much of last week due to the emergency, which had continued into the early part of the weekend due to "the collapse of a containment wall and Friday’s new fires in three wrecked storage tanks and a drainage ditch." Alarmingly, Bloomberg described a continued developing emergency situation with "Nausea, headaches and other symptoms drove about 1.000 people to seek treatment at a pop-up clinic, with 15 of the most-severe cases loaded onto ambulances and hauled to hospital emergency rooms." Class action lawsuits against facility owner and operator Intercontinental Terminals Co., including by Texas Attorney General Ken Paxton over the company's violation of clean-air laws, are reportedly in process of being filed. Reyna and her 18-year-old daughter Rebecca had been waiting for 2 1/2 hours at the pop-up medical center when the new fire erupted. They left without being seen because they didn’t want to get marooned there if the city ordered everyone to stay indoors. 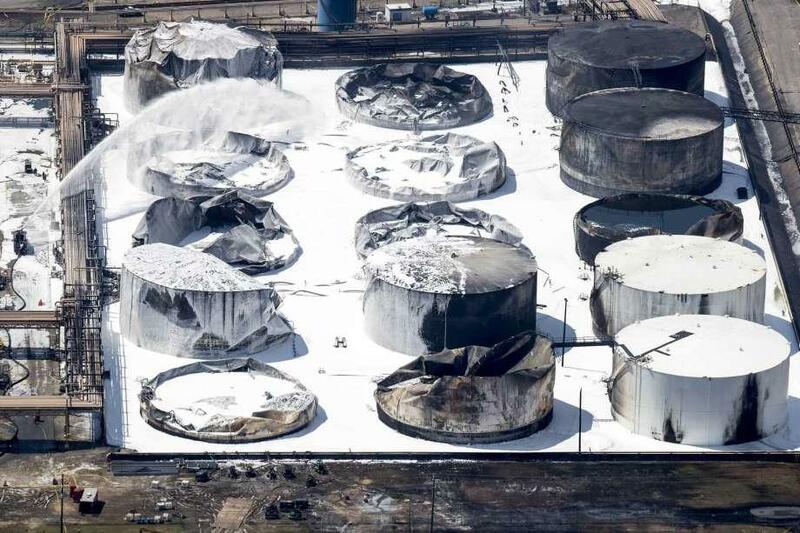 ITC officials had confirmed that about about "60,000 barrels (2.52 million gallons) of hazardous chemicals" still remained within the damaged part of the complex, which means it's not fully contained and should any further fire or event occur, could continue spilling into the waterway. The company is further reportedly offering a means for area residents impacted by the fire and smoke to receive compensation for medical issues or if they were forced to miss work or who had smoke soot damage to vehicles or homes. However, in going directly through the company claimants have to sign away their right to sue ITC now or in the future.